Bangladesh was born in 1971, attaining independence after a war with Pakistan, which was separated from India after its independence from the British Empire in 1947. It was inevitable for a country with a modern history of struggle to develop contemporary art with a high social awareness. In particular, Rhaman and his wife, Lipi, the two artists invited to the 7th C.A.J. 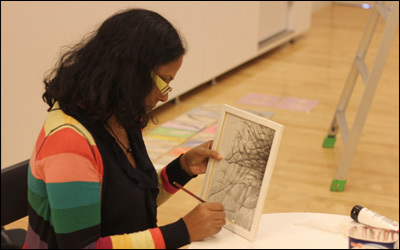 Artist in Residence Program are the founders of the Britto Arts Trust NPO established in 2002. This organization lead to realizing the Bangladesh pavilion at the 54th Venice Biennale in 2011. Both artists exhibited works in this exhibition together with the other three artists, and Lipi was also appointed as commissioner. Mahbubur Rhaman (b. 1969) completed an MFA at the Institute of Fine Art, University of Dahka, and has been showing his works and performances and opening workshops in Bangladesh and Asian countries, as well as Germany, UK, and Italy throughout his twenty years career. In 1994, he was introduced in the 4th Asian Art Exhibition at the Fukuoka Art Museum. He is without a doubt one of the contemporary artists representing his country. He belongs to a generation who proactively adopted new media such as video and installations. 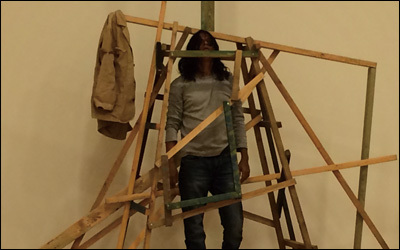 The Japanese artists’ installation exhibited in the Asian Art Biennale Bangladesh, where he himself had exhibited many times, had also inspired him in a certain way. However, his work criticized the present politics and society through the motif of Bangladesh history and mythology. In one of his performances, he expressed a suppressed farmer unable to change his situation, wearing horns and covering his body with a net. The work he created for this residency is the “Space” series, comprised of constructed square logs with a narrow space, and a video image of himself trying to go through them. It is as if to say that free spaces are a fantasy and not only Rhaman from Bangladesh, but also us Japanese are living with many barriers. In another work titled “Empty”, jeans and a shirt are puffed up as if an invisible man are wearing them, and fake bills are stuck in their pocket and are also drawn in the background. Perhaps an empty society of mammonism is what he saw during his stay in Japan. Tayeba Begum Lipi (b. 1969) learned painting also at the Institute of Fine Art, the University of Dahka, and has been acting broadly, showing her works and performances in Asian countries and Europe. Bangladesh women artists who emerged in the 1980’s and 1990’s painted scenes of violence, discrimination, sexuality of women, and issues around reproduction in a system of patriarchy from the view of feminism in realistic style, but Lipi, being of the next generation, deftly uses video images and installations. In “I wed myself” (2010), she acted as both husband and wife projected on two screens to express resistance toward being categorized as either one of “Man” or “Woman”. She also impressed us giving form to sensuality and violence borne by the female body in “Bizarre and Beautiful” (2011), a breathtaking installation composed of thirty brassiers created from three thousand razor blades exhibited in the Venice Biennale.In this residency, she expressed anger and violence in contrast to the adorableness of woman in “What Kind of Knife You Are”, and nullified the the dichotomy of good and evil through the combination of the English term “Bad”, Japanese “Good”, and Bengali in “Bad & Good I” and “Bad & Good II”. 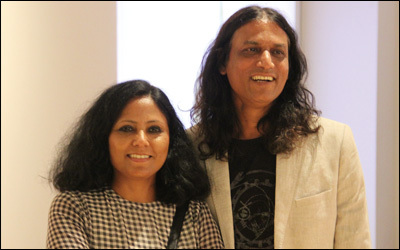 Hopefully this has given these artists the opportunity to prove themselves through their recent works, at least the video that are easy to transport, since we have little chance to see Bangladeshi contemporary art in Japan. A longer period may have been necessary to create work showing their true ability, though we must regrettably understand that this kind of program is always beset with financial issues. However, the significance of an international program like the C.A.J. Artist in Residence is in the exchange between the artists. The experience of the two artists touching Japanese society may flower in the works after their return or Japanese artists may be able to consider another program for them to visit Bangladesh. I hope to see the progress of this program in the road ahead.